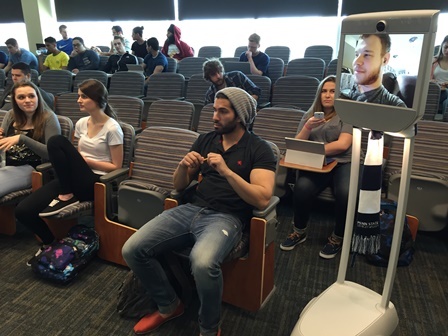 Students taking a geography class at Penn State University (PSU) might find themselves sitting next to a robot instead of just their peers. PSU is running a pilot program involving Suitable Technologies’ Beam robots. A year and a half ago, Suitable Technologies, a Palo Alto-based company that produces remote presence devices, loaned PSU two Beam robots to test throughout its student body. According to Chris Stubbs, Manager of Emerging Technology and Media for PSU’s Teaching and Learning with Technology program (TLT), remote students can operate these robots through a mobile app. Standing about 5 feet tall and resembling “an iPad on a stick with wheels, but sturdier,” the robots attend classes physically and the student can see everything the robot sees. The slender white machines have a screen that displays the user’s face. According to Stubbs, these robots offer great potential for students with disabilities and remote access to campus. Stubbs said that, for the past 18 months, the robots have been shuffled between different disciplines and across the university’s 24 campuses. Professors in different departments are determining how the robots can affect their students as they test the devices. Stubbs said that, while the Beam robots may not be optimal for 300-person lecture classes, they are useful for informal visits to professors and classes that involve moving around different desks, such as architecture studios. The TLT team continues to test the Beam robots throughout different campuses and departments. While the robots are technically able to travel wherever there is a Wi-Fi signal, Stubbs said users have been keeping them indoors. He said that, after the testing period, professors and administrators will discuss whether they want to start phasing robots in for continued use. Remote students can view their classes through a live feed, but Stubbs said the traveling robot offers a richer experience. Beam said that, so far, 20 professors and even more students have used the robots. The geography class has the robots for testing now; next, the education classes will have a turn. Some of the users have included students who could not make it to class because they were working and international post-doctoral students who could not physically be on campus.